Many features from Hexagon have been ported over to Carrara, but not all of them are obvious and easy to find for Hexagon users. The one Hexagon tool I was missing most was Vertex Modelling – Tweak, which is very similar to the Utilities – Stretch tool. I was looking all over Carrara and couldn’t find anything equivalent. Until I realised that this function is enabled by default! As long as you’re in Carrara’s vertex modelling mode, Move Tool enabled (T) and Paint Selection deselected. Simply hover over a polygon, edge or vertex and start moving it just like in Hexagon. Utilities – Lay On lets you align two faces against each other in Hexagon. Carrara doesn’t have such a tool, but you can get the same results by using a combination of two functions in the Assemble Room: Edit – Align and Collision Detection. For this to work, both objects must be individual objects, they can’t be two cubes that are part of the same vertex object for example. But they can be two unrelated objects (say a primitive and a spline object). Position them loosely they way you want them, then select them. 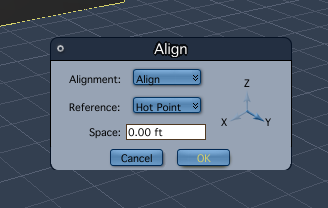 Next head over to Edit – Align (this option is greyed out if only one object is selected). From the modal window, select all axis you’d like to align, as well as how you want to align them. Hot Point or Center works well. Now the objects are in position, but not quite touching. To make that happen, select the little “three ball icon” in the title bar of the current document. Collision Detection is not related to the physics engine. Instead it’s a positioning tool you can use in your scene. Extremely handy! When you either select Edit – Duplicate, Carrara remembers the changes you’ve applied to your first copy. 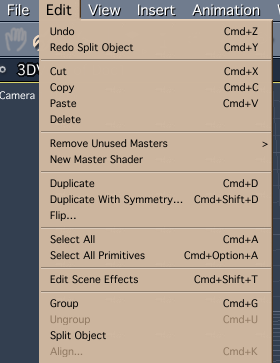 Don’t select any other object in between, simply make your first copy, apply a change, then duplicate again. The next copy will have your changes automatically applied. Here I’m building simple stairs using Collision Detection to place the first copy on top of the other one. Then I’ll simply select Edit – Duplicate again until my staircase is tall enough. Hexagon takes care of giving each new 3D object an automatic name (like Form3, Line20 and so forth). This happens automatically as soon as you create a new object. With Carrara and its modellers it’s a little different. Instead of creating one Vertex Object, and then adding several parts to this object (Construct 3D – Cube, then Construct 3D – Sphere, etc), create each part of your model as a separate object. In fact, mix and match kinds in a single object by amalgamating several parts from different modellers. Then select all items that belong together and select Edit – Group. If you add two cubes in the same Vertex Object, Carrara will see them as a single object. 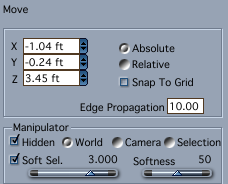 To split them apart, select Edit – Split Object and a group will be created from all those separate parts. Very neat! The key thing to note is that an object and its components are created in the Assemble Room rather than in one of the modelling rooms. Carrara has those and many other deformers under the Modifiers Tab in the Assemble Room. Click the plus icon to add a modifier, then tweak the values as you like. 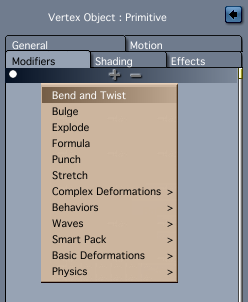 You can even combine multiple modifiers and animate them if you like. Twist and bend are only the beginning. Wait until you try explode! Quick note of caution though: Modifiers work great inside Carrara. However if you intend to export geometry created with those, forget it: even though it works, the amount of unnecessary vertices you get is rather frightening. What’s missing from Carrara’s Vertex Tools? Why not just use Hexagon instead? As much as I love Hexagon, it hasn’t seen a major upgrade since 2006. Even though Hexagon’s feature set is rather complete, it has numerous bugs that can cause the app to crash frequently – depending on your system and what you’re doing with it. DAZ have chosen to keep the much more feature rich Carrara under development, but it appears that Hexagon has turned into abandonware. Don’t get me wrong, I find it rather charming that the software still looks and feels the same as it did many years ago, but there is a danger that on future operating systems Hexagon may stop working altogether – you never know if and when this may happen. Therefore it’s good to have a “backup solution” for your 3D modelling needs. Until then, when using Hexagon, save early and save often. Make use of the Incremental Saving feature or use Version Control. Leave a comment and share them with the world! I do have a tip I’m afraid: Don’t bother if your serious about 3D, it can’t cope! But it does sadden me to admit I just deleted it off my computer! Bye bye Hexy .. loved ya … I did honest! (Isn’t a bucket list supposed to be full of all the things you would just love to do before you die? Why is my bucket list full of mind boggling software I ‘MUST’ conquer? You did the right thing: Hexagon hasn’t been looked at in a decade by the dev team. Still it’s one if the easiest 3D modellers for my brain to grasp.